The American Diabetes Association lists citrus fruits, including lemons, as a top 10 diabetic superfood. Lemons are best known for their vitamin C content, but their fiber and acidity also slow digestion, causing a steadier rise in blood sugar levels. By getting key nutrients through foods rather than supplementation, you have a better chance of improving your blood sugar. It's easy to get in the habit of adding this tasty and inexpensive food to your dietary regimen. Carbohydrates are macronutrients found in grains, beans, vegetables and dairy foods. Your body breaks down carbohydrates into a simple sugar called glucose, which is then transported to the cells of your body. All carbohydrates, whether pasta or soda, are made up of sugar molecules, but they affect your blood sugar levels differently. How quickly a carbohydrate-containing food increases your blood sugar depends on the sugar molecules present and the rate at which you digest them. The glycemic index is a scale that compares how rapidly a food increases your blood sugar. A variety of factors affect a food's glycemic index, such as acid. Lemon juice is acidic, and it slows how quickly your stomach empties food so your body takes longer to break apart sugar molecules, causing a steadier rise in blood sugar levels. For examples, sprinkle lemon juice on white rice to lower the GI of the rice, or drink lemon water with your meal. One to two tablespoons of lemon juice may reduce the impact of a meal on your blood sugar by as much as 30 percent, according to an article in "Reader's Digest." 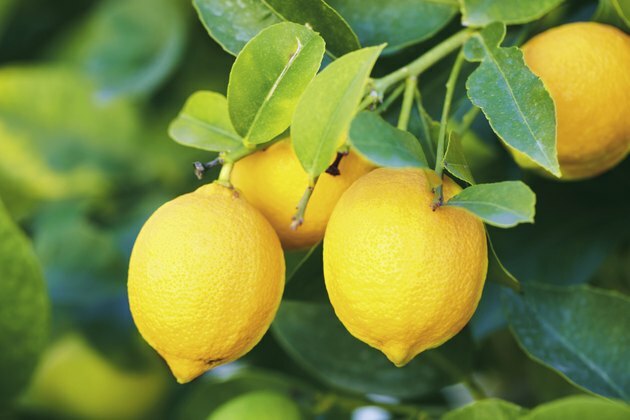 Lemons are on the American Diabetes Association's superfood list because of their soluble fiber content. Fiber is a carbohydrate, but your body can't break it down so it does not impact your blood sugar levels. Soluble fiber in particular stabilizes blood sugar by slowing the absorption of sugar into your bloodstream. The Joslin Diabetes Center recommends you consume between 20 and 35 grams of fiber daily. The juice from one medium lemon contains 2.4 grams of fiber, or between 7 and 12 percent of that recommended amount. Add lemon slices to water to sip on throughout the day, or add fresh lemon juice to hot and cold unsweetened teas. Splash lemon onto rice dishes, onto pasta with fresh vegetables or as a seasoning for poultry and fish. Incorporate lemon juice and zest into salads and salsas. Buy fully ripe, heavy, thin-skinned lemons, which have more minerals than thick-skinned lemons. Keep them at room temperature away from sunlight for up to one week and then store them in your crisper drawer.